United States Senator Ted Stevens of Alaska has been indicted by federal grand jury on seven criminal counts for making false statements in his Senate financial disclosure forms. The longest-serving Republican in the Senate, Stevens is the highest-profile politician ensnared in the corruption scandal surrounding VECO Corporation and its executives’ attempts to influence politics. VECO, a subsidiary of CH2M Hill as of September 2007, is an oil pipeline and services company. It is alleged to have funded renovations to the Stevens home in Girdwood, Alaska in 2000. The renovations include a new garage and first floor, a two story wrap-around deck, as well as new wiring and plumbing. In 2007, VECO chief executive Bill Allen pleaded guilty to charges of extortion, bribery, and conspiracy. Stevens was reportedly caught unawares on Tuesday when the indictment charge was filed. “Apparently, the media knew about it before he did,” Inouye stated, adding that he had just talked to Stevens. 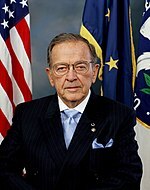 Ted Stevens was in a meeting with other Republicans when he found out about the charge. The United States Department of Justice says it has already obtained seven convictions in the case: Peter Kott, a former Speaker of the Alaska House of Representatives; Thomas T. Anderson, a former state representative; Victor H. Kohring, another representative; James A. Clark, chief of staff to the former governor of Alaska; William Bobrick, a lobbyist; Bill Allen, VECO chief executive; and Richard L. Smith, VECO vice president of government relations.